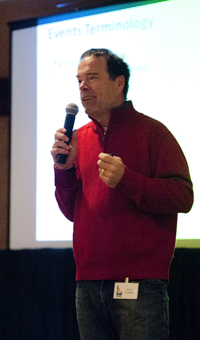 A local economic development expert shared his findings on the financial impact of special events in resort communities with the Idaho Economic Development Association at a statewide conference in Sun Valley on Thursday morning. Sustain Blaine Executive Director Harry Griffith shared his findings with a group of about 40 economic development experts from around the state during a presentation at the Sun Valley Inn. The goal of his study, Griffith said, was to form a set of benchmarks for what makes a special event successful, and then use that information to help advise the creators of new events. “We would be able to tell them, OK, you should try selling tickets at this price point, or you could add another sub-event,” he said. All of Griffith’s data was from 2011 and focused on 16 “marquee” events such as Wagon Days, Trailing of the Sheep and the Sun Valley Summer Symphony. He noted that though the information was two years old, he is in the process of updating it and plans to refresh his data every two years. The information was gathered from event organizers as well as visitor surveys, he said. The special events study focuses on which events have the most direct and indirect economic impacts, as well as how many participants each event attracts. Overall, Griffith said, events bring 24,000 visitors and 13,000 second-home owners into the valley. While locals also attend events, Griffith said that indirect spending by visitors and part-time residents—such as grocery shopping, lodging, restaurant and bar tabs—help special events bring an estimated $41 million into the valley each year. But not all events are created equal. Griffith said some events, such as Wagon Days in September, bring in a high number of participants—about 31,000 people—who each spend a relatively small amount of money, in part because the event is free and it’s family-oriented. Griffith said that’s in contrast to an event such as the Allen and Co. media conference in July, which brings a lower number of participants—maybe 300—but each participant spends far more than the average on lodging, food and other amenities. Griffith said in a later interview that many Allen and Co. participants fly in on private planes, and therefore pay landing fees and fueling fees as well. Griffith said his data shows that there is an “event sweet spot,” a balance between participant numbers and economic impact that most events should and can strive for. For example, he said, an event such as the Ride Sun Valley bike festival has a beneficial number of participants, but would have more impact if it could increase participants’ indirect spending, perhaps by marketing to more families and spectators who would stay in hotels and eat in restaurants. “Instead of crazy bikers who camp out and eat out at restaurants a few nights a week, can we maybe get more family members?” he said. As for events that have a high economic impact per participant, Griffith said Sustain Blaine can work with the events to help them boost participant numbers. Griffith said that Sustain Blaine is open to working with any event organizers, even the ones not included in his “Big 16,” and that such analysis can help events that are looking for public funding. “We are trying to create an expectation that when someone goes to [a city] or a foundation is asking for money for an event, the people on the other side of the table say, show me your statistics,” he said. Griffith said after the lecture that he is working to update his data for 2012 and has added events such as the MASSV music festival and the Sun Valley Film Festival, as well as the Blaine County Fair. But he said that the organization has a good idea of the big picture.